Good luck with the challenge, I don't love paranormals so I'm siting this one out. Btw, does you have a twitter? Haha, yep, I have no impulse control :) I do not have a twitter account though. I'd be totally overwhelmed if I did! 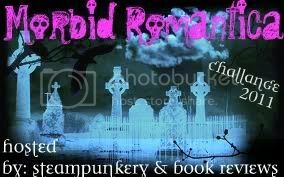 I'm excited for Morbid Romantica to start! I can hardly decided which book to starte off with! Wow, good luck with all your challenges!